You can hardly have missed the fact that Olivier Messiaen was born in Avignon on 10th December, 1908. But I wanted to find out exactly where he was born, and even better share a photo of the birthplace with my readers. So last week I arrived in the ancient city of the Popes as the centenary celebrations were in full swing. I dropped my backpack off at the Hotel Mignon, walked down to the Tourist Office and asked the question, where precisely is Messiaen's birthplace? 'Ah', came the disarming reply, ' that is an interesting question, which no one has asked before. Moreover we don't know the answer.' But not to be outdone the local Messiaen experts were consulted. After a few phone calls all was sadly revealed. The birthplace has disappeared; a victim of the small amount of redevelopment that has been allowed in the ancient city. So, dear readers, instead of the precise house I offer a photo taken near where the composer was born. 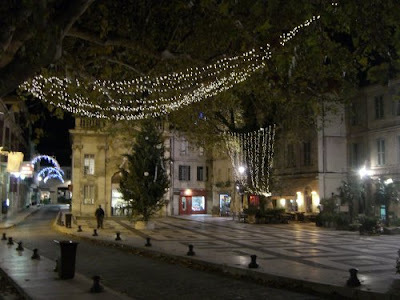 La Place Crillon is decorated with Christmas lights. Which is appropriate as Messiaen was born at midnight on Thursday 10th December, 1908, prompting his grandfather to sing the old French carol ‘Il est né le divin enfant’. Although I was thwarted in my search for Olivier Messiaen, Avignon, as usual, yielded many delights. No visit to that most civilised of cities would be complete without a visit to Wolfgang Zuckermann's La Libraire Shakespeare. The expatriate German turned expatriate American is still presiding single-handed over his splendid English bookshop in the Rue Carreterie. A conversation about Messiaen led to John Cage. Wolfgang Zuckermann told me how, in his previous incarnation as an authority on, and manufacturer of, harpsichords, he provided Cage ("an absolutely charming man") with multiple instruments for a performance of one of the composer's works. The date and details of the work were not clear. Cage's HPSCHD for seven harpsichords and fifty-one tapes seems to be the most likely candidate. It was given its first performance in May 1969. Later that year Zuckermann abandoned his harpsichord business and America in disgust at the country's involvement in the Vietnam War. Of course I came away from La Libraire Shakespeare with yet another book (Tim Mackintosh-Smith's Travels With A Tangerine) to add to my staggeringly heavy backpack which already contained the new 822 page life of John Lennon. The world needs more people like Wolfgang Zuckermann. At least Darius Milhaud's birthplace was not as elusive. I'm so glad you relinked this post! I was in France this past March and followed the exact same path you did, sans the Messiaen experts. Actually, the puzzled worker at the Tourist Office told me after a quick internet search that his original home might have been destroyed during the WWII bombings (which eerily resonates with me just a little more after reading your most recent post). They directed me to the church where he had been baptized, which I made sure to take a few pictures of. I couldn't find the supposed plaque with his name on it, but that's about as close as I got to the composer. Have you also visited La Sainte-Trinité in Paris? I asked the people there if I could take a look at the organ but they were NOT having it.